This has been Twofold's running style since the early 90's. 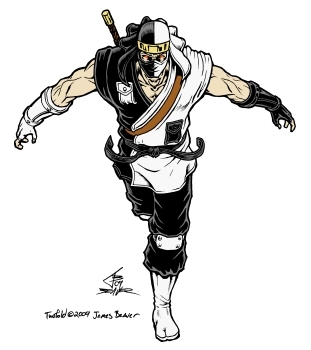 It's that classic fictional ninja run where they have Smooth Criminal lean forward with a 45 degree angle. Kenji does it slightly differently in that he has his arms outward and angled back as if he's both trying to be more aerodynamic and look like he's not trying to block incoming attacks. I drew this pose a few years back but I needed a better one in his current outfit with the new armguards. I was tired when I drew this and almost fell alseep before the inking was finished. Luckily this is one of my favorite Twofold poses and the fun of drawing it again kept me awake.